As I’ve mentioned since starting my Everything Austen challenge, I’ve had such a wonderful response from both authors and publishers who have been really great in sending Austen-inspired books for giveaways. Next up is the highly anticipated follow-up to Pride and Prejudice and Zombies by Quirk books – Sense and Sensibility and Sea Monsters! Quirk books has very generously sent me THREE copies of Sense and Sensibility and Sea Monsters to give away! To enter to win a copy of S&S&SM, just leave a comment in this post along with a valid e-mail address. For an additional chance to win you can Tweet about this giveaway (@SWrittenWord has THREE copies of Sense&Sensibility&SeaMonsters to giveaway!! http://tinyurl.com/okusps #everythingausten) or post about this contest on your own blog. Please note that this giveaway is open to everyone (including my international readers!) and you have until Saturday, September 12th at 8 p.m. EST to enter. I will announce the winners the next day. Good luck!! If you enjoyed the above book trailer, take a peek at Leeches in our Pants, The Making of the Sense and Sensibility and Sea Monsters Book Trailer here. Thanks again Quirk for sending the books to me for a giveaway! Sense and Sensibility and Sea Monsters will be released on September 15, 2009. Oh yay! please enter me! OOOH! I’d love to win this book! I can’t wait to read this book! 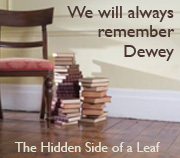 How could anyone not want to read it after seeing the awesome book trailer?! How do you do what the Julie and Jenn did? sort of newbie tweeter! Thanks for enter me. This is an awesome giveaway! Please enter me! I really like this series of books and think they are a lot of fun. Oh I’d love to win a copy of this! I picked up P&P and Zombies the other day in the store and stood and read it for a few minutes! These are too funny! 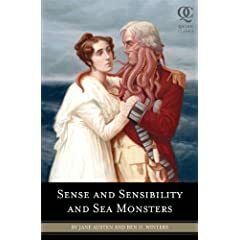 Reading Pride & Prejudice & Zombies right now, so would love to get a copy of Sense & Sensibility & Sea Monsters to read for Everything Austen as well. I will also be tweeting this! Throw my name in too…thanks! I would LOVE to win a copy of this book. I loved P&P&Z and can’t wait to see how Sense and Sensibility fares with sea monsters! Yes, Please sign me up . . . would love a copy. P&P and Zombies is my next read. Yippee! Having recently seen the movie, Sense and Sensibility, I would LOVE to win this book! 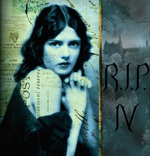 I will post about this in my blog’s sidebar (complete with ridiculous cover!). Oooh, so cool. Count me in, please. Thanks! Oh yes please! I tweeted too. Loved the trailer the last time you linked to it. Please please enter me into this give away. I really want to read this book. First time I heard of this book and I am really curious, thanks, please count me in! I’d love to be entered to win! I’ll keep my fingers crossed! Btw, tweeted and will make mention on my blog. I have my eye on this book already. I would love to win. Thanks for the chance. Please enter me – I am falling behind on the Everything Austen challenge! I have only read one book so far, but if I win this I promise I’ll read it LOL! how exciting, I’d love to be included!! I laugh out loud at that trailer every time I watch it…which is every time I see it posted! Please enter me. I need another novel to read for Everything Austen! I also added this post to the sidebar of my blog. Please enter me. This one looks like a lot of fun! I have P&P&Z here so I must read S&S&SM! Thanks for the great giveaway!! Yeah, I would love to win this book! Don’t know how to link it to the URL, though, sorry! Sounds like an interesting read. Please include me in the giveaway. P&P&Z is on my To-Read list, so I’ll definitely add this one as well. Sign me up! I have been looking forward to reading this! Please enter me in your giveaway! Would LOVE to read this one…thanks for the opportunity. Thanks for the great giveaway! Please enter me. This looks like a fun read. oh oh oh oh!! enter me enter me! pllsss!!! Oh, PLEASE enter me to win – I would absolutely be THRILLED to win this book! read P&P&Z and loved it, so excited for S&S&SM!!! Send a copy to me please! Sweet giveaway! Please enter me. I’ve been wanting this one! Please enter me!!! oo I think I’m comment 68 – good year that ;-P.
I would love this book and YAY thanks for making it an international comp.. Australia thanks you. I’ve twittered the comp too. Please count me in….thanks, Stephanie. Enter me please! !f Thank you!! OMG, want this book! Loved their first mash-up, and can’t wait to see what’s in store with this one. Great fun! I can’t wait to read this, I loved Pride and Prejudice and Zombies. This looks like such a fun book. Thanks for the chance to win! I’ve been wanting to read this book. Hey, I’d love to be in this contest. thanks! awesome trailer! i would love to win this book. please enter me! Sounds very interesting. Count me in! I love everything Jane Austen and have read most of the books, and seen quite a few of the movies and series. Jane Austen is for eveyone to enjoy. As the colder months approach, it is time to read more Austen!